TIFFIN, OHIO – October 12, 2018 – Findlay-based roller skating rink Rolling Thunder announced today intentions to close their current location and to work toward opening a new location in Tiffin in late 2018 or early 2019. Owner Tim Thwaits said he has been looking at the Tiffin market for more than a year and has identified a possible location. “Our research over the last couple years shows that much of our business is from Tiffin and Seneca County. We have the opportunity and the time is right to move our business here and provide a family friendly activity center to the community,” he said. Rolling Thunder has been a staple of the Findlay-Hancock County community since the end of 2010, providing kids and family entertainment through a skating rink, arcade, birthday party services, as well as skate sales and repair. The same amenities will be offered in the Tiffin location, which is anticipated to be larger than the current Findlay location, allowing for the possibility of a larger rink and/or more entertainment options. Several details have yet to be finalized. The Findlay facility will be closing January 1, 2019 in anticipation of the relocation. Tiffin Mayor Aaron Montz supports the planned development. “I am pleased that Tim is looking at Tiffin to relocate his operations and the City of Tiffin will do whatever we can to help facilitate the move,” he said. For the first time since 2000, the unemployment rate in Seneca County dipped below four percent, coming in at 3.9 percent for April 2018, an 18 year low for the county. In comparison, Ohio’s unemployment rate was 4.3 percent and the national rate 3.9 percent, according to a May 18 press release from Ohio Job and Family Services. Many factors contribute to the growth in employment, including the availability and access to jobs. Between 2014 and 2017 alone, Seneca County saw $339 million in business and building establishment and expansion, creating more than 1,400 jobs. Spire Advertising – A satellite office for an Ashland, OH based advertising firm announced in March, opening in June 2018. The Chandelier – A new event space set to open in the former Community Civic Center in downtown Tiffin later this year. Trilogy Health Services – Announced in April, Trilogy is to build a senior living facility that will employ 110, at an estimated investment of $14.5 million. Kiku Fusion Sushi and Steak House – A full-service sushi and hibachi restaurant to locate in the Tiffin Mall later this year. Panda Express – An international chain serving fast-casual Chinese cuisine was approved for a setback to build on the Tiffin Mall site. Senecare – A local pharmacist has started a new business in the Laird Arcade offering one-on-one pharmacy services. Time Staffing – A northern Ohio-based staffing agency opened a branch in Tiffin earlier this year, growing to a total of 9 offices throughout the region. Yoga Chuck Health and Wellness Studio – Longtime yoga instructor Chuck “Yoga Chuck” Burmeister renovated and opened his own studio. The Attic – A new specialty shop in downtown Tiffin, an expansion of a successful Findlay, OH store. 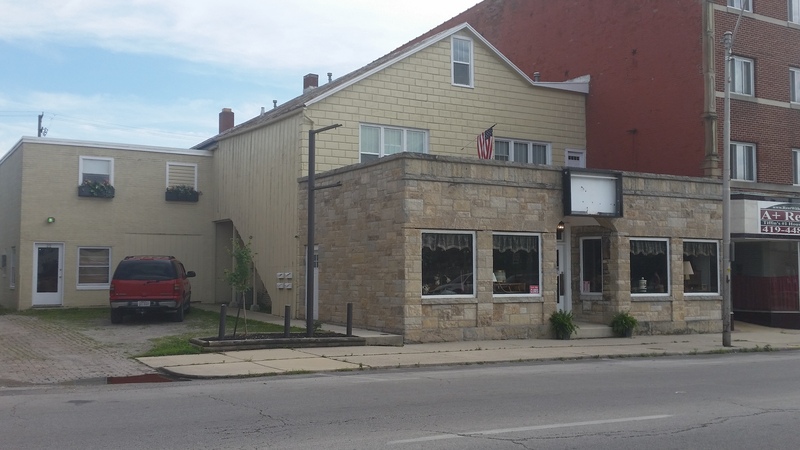 Glass N More Store – Another specialty glass shop that opened its fifth northern Ohio location in downtown Tiffin. Stover Veterinary Services – Veterinarian Dr. Amber Stover and her husband launch a mobile vet clinic in early 2018, to be accessible throughout Seneca County. Tiffin Candle Co. – A Tiffin couple has created their own business producing and selling community themed candles with a charitable aspect. Mantra Mind Management – A new consulting business in the Laird Arcade focused on self-discovery, emotional regulation, and vision creation. Wireless Boys – A Boost Mobile retailer opened their doors on W. Market St. in Tiffin earlier this year. Reineke RV – Reineke Family Dealerships purchased and relocated Fort Ball RV to W. Market St. earlier this year. Kent Zellner, formerly of Zellner’s Pharmacy, is opening a new business in downtown Tiffin focused on personal pharmacy consulting services. Senecare will help customers with Medicare chronic care management, transition of care, pharmacogenomics, medication adherence, disease state management, and general pharmacy consulting. Senecare will work with Medicare on the Chronic Care Management program to provide services to eligible patients, serving as a liaison between Medicare and the patient’s doctors, checking in on medications, and making sure the patient is following up with the correct doctors. They will also assist with transition of care, assuring that a patient is on the right medication and doses after a change in care, for example, a patient returning home after a hospital stay, and medication adherence, making sure patients are taking medications correctly. Disease state management for chronic issues such as diabetes, asthma, cholesterol, and smoking cessation will be available, as well as pharmacogenomics, a DNA sample test that can determine which medications patients would respond to and how they would interact in the patient’s system. The business is expected to open in the Laird Arcade in downtown Tiffin in mid-late June. Senecare can be reached at 567.220.7207. A new mobile phone retailer is coming to Tiffin. A Boost Mobile franchise is set to open next week in the retail center currently housing Chipotle, at the corner of Ashwood Drive and W. Market Street. Wireless Boys began in 2011 and currently owns and operates 15 Boost Mobile franchises in the Northwest Ohio area. Their most recent store opened in Fremont this week. The retail center was constructed in 2016 by Diverse Development, a real estate development firm based in Holland, Ohio. The center includes three units, one of which (a 1,400 square foot end unit) is still available for lease. Now open for business, On Pointe Performing Arts Studio, LLC is accepting registration for Fall 2017 classes. On Pointe is a new dance studio located in Bodyworks. On Pointe offers dance classes for ages 3 to 18. They accept dancers of all levels. Classes offered are ballet, jazz, tap, lyrical, and hip-hop. Vicky Boehler, owner and founder, along with her two daughters, Brooklyn and Kaitlyn, are excited to see the company develop. The studio will incorporate educational learning during class for younger students, as well as add the personal touch that people are looking for in a small town. Training for fifteen years, the daughters developed a strong passion for dance and desired to own their own studio. Their mother was drawn into the business venture. She was captivated by the art and enjoyed attending every performance. As Tiffin University alumni, they believe their education, varying expertise, and experience has prepared them for this adventure. On Pointe will have an open house on Saturday, June 24, 2017 from 10 a.m. to 1 p.m. Another open house is scheduled Saturday, August 21, 2017 from 10 a.m. to 1 p.m. Parents and potential students will have the opportunity to visit the studio, meet the teachers and owner, and register for classes. The studio will host a summer dance camp from Monday, June 26. 2017 to Friday, June 30, 2017 from 5 p.m. to 6 p.m. The camp is offered for ages 3 to 8; no experience required. This year’s theme, “Groove at the Zoo,” will include educational activities, crafts, and a dance performance for parents to view. The camp is $25. A registration form for the summer dance camp is available at Bodyworks. Registration forms are available and must be returned to Bodyworks. Upon registration, everyone will have a chance to win three months free tuition for one class and have a free trial class per genre. On Pointe also offers a family discount and a multiple genre discount. For more information, please contact On Pointe by email onpointeperformingartsstudio@gmail.com or call 419-455-4082. More information can also be found on their Facebook page. Jimmy John’s sandwich shop opened its doors at 2161 W. Market St. in Tiffin this morning. They are open everyday 11 a.m – 10 p.m., and features a drive-through window and delivery for their “freaky fast” subs. Franchise Owner Aaron Taylor has two stores in Sandusky and one in Fremont, and said Tiffin was the ideal market for a new store. “With the population size, two universities and the hospital, Tiffin is the perfect location,” he said. The shop is located in a two-unit development shared with an AT&T store, which will be coming soon. Customizing the Jimmy John’s store was a $350,000 project, and it is currently staffed by 30 employees and still accepting applications. Check out their menu here and their catering options here. Partners Dave Underwood and Tony Weiner have announced the opening of their new second-hand shop, Another Man’s Treasure, at 20 East Market Street. The building is a mixed-use development featuring a retail store as well as three renovated apartments. Underwood choose the Tiffin location because of his positive impression about the town. “Tiffin is a nice city, with nice people. It’s clean and people care about the community,” he said. The original concept was to be a second Splinter’s Cafe restaurant, modeled after the original Carey location. A few months ago, Underwood decided it made better business sense to redevelop the property for retail use. The pair also plans to expand the store in the future. In addition to the current store space, another room is being prepared as a show room, and there are plans to open up a boarded off garage door as a display window. There are also two warehouses in the back with a patio that they plan to use as an outdoor display space. Updates, including new paint, have already been made to the storefront, and further landscaping is planned. The store is open from 10 am to 6 pm, Tuesdays through Saturdays, and the store can be contacted at 419.455.3146. The South Korea-based vinyl tile manufacturer Nox Corporation is locating its first US factory in Fostoria. 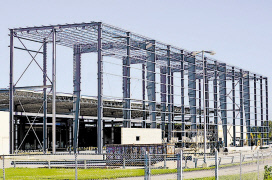 Nox will be renovating the former Atlas Crankshaft building, and plans to create more than 150 within three years in Seneca County. The company will invest millions in machinery, equipment and building renovations, including a $2 million, 16,820 square foot addition to the existing building. Nox will initially hire 50 new employees, with plans of hiring an additional 50 workers next year and a total of 150 in the next two to three years. The company is currently interviewing for 10 management and administrative position, and will begin the hiring process for 40 skilled production, quality control and maintenance jobs next month, with production slated to start in mid- to late fall. Wages will start at $12 per hour, with an increase to $16 after a year. Kudos to the Fostoria Economic Development Corporation for their work on the project and to Regional Growth Partnership and JobsOhio for their support. Nox Corp. manufactures vinyl tile for commercial customers to use in building flooring for applications like hospitals and large offices. The tile is sold in 50 different countries, but the Fostoria plant will primarily serve US customers. Nox looked into locating in Fostoria due to recommendations within the flooring industry. Rubber and vinyl flooring manufacturer Roppe has been headquartered in Fostoria for more than 50 years. 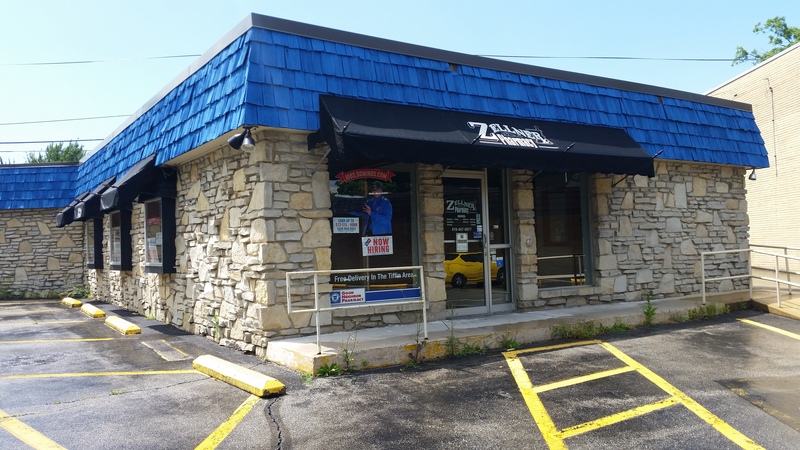 TIFFIN, OHIO – July 15, 2015 – Regional Domino’s franchise owners Brian and Jennifer Edler announced today that they are bringing the second largest pizza chain in the world back to Tiffin. The store is set to open in October at 240 West Market Street. Jennifer said they chose to open a Tiffin location because they often visit the town and believe it has great potential. “We go through Tiffin a lot visiting family in Willard, and Brian managed a Domino’s store in Tiffin about 20 years ago. We know the town pretty well,” she said. “I am happy to welcome a new restaurant to Tiffin and have a strong national brand alongside our locally owned businesses, creating more options for the community,” Tiffin Mayor Aaron Montz said. Though the opening is weeks away, they are currently hiring employees for the Tiffin location to be trained at other locations, in order to be ready for the opening. Jennifer said a store of this size usually requires about 20 employees. Brian Edler is a notable Domino’s franchise owner, with 12 other stores. In 2012 Domino’s began selling the Parmesan Bread Bites he invented nationwide, and he was featured in a national ad campaign to promote the new item. He is the Midwest chapter representative of the Domino’s Franchise Association and in May of 2015 he won the International Franchise Association Gold Franny Award for operational excellence. He broke the world record for most pizzas made, cooked and boxed in an hour, as part of an event that raised over $37,000 for local and national charities. “We are big believers in supporting all the communities in which we own and operate stores, and will do so when we open in Tiffin,” Brian said. Founded in 1960, Domino’s is the second largest pizza chain in the United States and the largest worldwide, with 11,000 franchise and corporate stores in 70 countries.